Who made the best card? Select 1 removed from play Psychic-type monster. Special Summon up to 2 Psychic-type monsters from your Hand, Deck, or Graveyard with the same name as the selected monster, ignoring summoning conditions. This card can be Special Summoned from your Graveyard by paying 1000 Life Points. 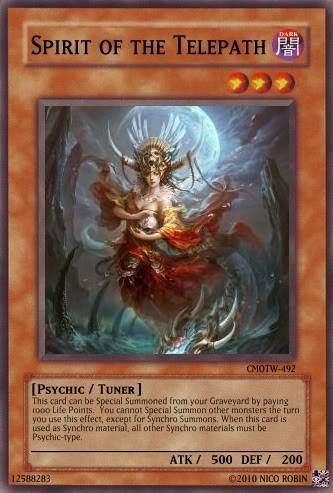 You cannot Special Summon other monsters the turn you use this effect, except for Synchro Summons. When this card is used as Synchro Material, all other Synchro Materials must be Psychic-types. If this card is sent to the Graveyard as a Synchro Material Monster, you can pay 800 Life Points at the End Phase to add 1 Psychic-type monster or 1 Normal Spell Card from your Deck to your Hand. While in you Graveyard, this card's Level is treated as 2. 1 Normal Spell Card? o: so broken. Insta-Dark Hole or Monster Reborn. But I assumed that you were asking if you could do every week, so please do, or i'll have to reclose this section.